I've teased off and on over the past couple of months that I'm researching another book. I've actually got work decently underway now, so I figure I'll go ahead and put the word out. The book is tentatively titled Harry Blackstone, The Comic Book Magician Detective. (A little cumbersome, I know.) 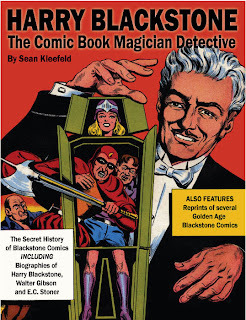 It's a look at the Blackstone comics of the 1940s, which have been largely neglected because A) the title character was pretty famous for his other work as a stage magician and illusionist and B) writer Walter Gibson was pretty famous for his other work as creator and primary writer of The Shadow. Even the original artist, E.C. Stoner, was known more for his advertising work, including the original Mr. Peanut! Anyway, I'm writing about how all of that came about to create some entertaining Golden Age comics, and I'm also going through and cleaning up some scans of about half a dozen issues to reprint for the first time ever, I believe. At the left is my initial shot at a cover design. Needs a little work yet, but it's something I can use as a promo piece for now. I probably won't have it ready until January or February, but I'll keep you posted on progress. That's definitely an interesting concept. Do keep working on that cover design.